The entire concept around this anime is a work of art. The dialogue is good and the art is on a completely different spectrum. Its crazy how far anime has come. This is a definite watch for anyone. The art alone soothes the eyes. This anime caught me off guard with it's artwork, very fluent and colorful, also the underwater part of this anime is very original. So far it is very nice and I believe this anime will come far on crunchyroll. Its quite an interesting world they live in, hopefully they expand on the universe and the characters develop a bit more. I love how they live like normal underwater, and they're not like mermaids or something. The storyline and the artwork intrigues me every second I watched this. It's absolutely brings out a little "oomph" to it. Hopefully the story line and plot is good and has a bit of a twist to this cute new anime. First time out of 500 anime series iv watched and this one was the best anime I have seen all year. The site is taken place underwater and the scene is amazing. The detail put into the story and the characters is perfect except for the love quarrel. I Highly recommend this series to other people who love the sea and anime. The writers really need a day at the beach to learn how things behave underwater; they took a neat idea and absolutely ruined it in the first 30 seconds. You can't just paste some swimming fish and the occasional air bubble over top of how people and things behave in air to make it "underwater". Story seems to be getting better & better. Music is very beautiful and really loving the ending music of each episode. Art is at its best. Characters are wonderful too, each episode makes you gonna wanna know whats gonna happen next and thats what i look for in animes nowdays. Now i wait another week for thursday to come :(. This Anime Absolutely MUST watch!! 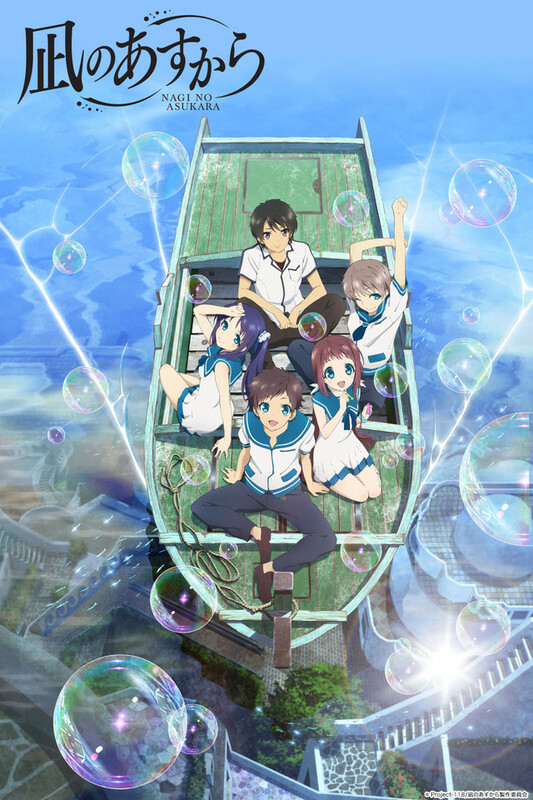 This anime, Nagi no Asukara, is very moving anime series. It is about the sea people and the surface people who are both humans but have some differences between them. The art and the music is beautiful. It makes you want to know what's going to happen next and the storyline and characters are very well thought. I look forward to watching this anime. Watching this anime is a MUST!! I think this is the most surprising show this fall. It's gone a bit under the radar because there are so many good shows this fall but is probably one of the best. Although the animation is nothing special the amazing story and characters more than make up for it. It's been a bit of an emotional roller-coaster so far and i'm excited to see how the the rest of the season plays out. This should definitely be one of the shows you're watching at the moment!